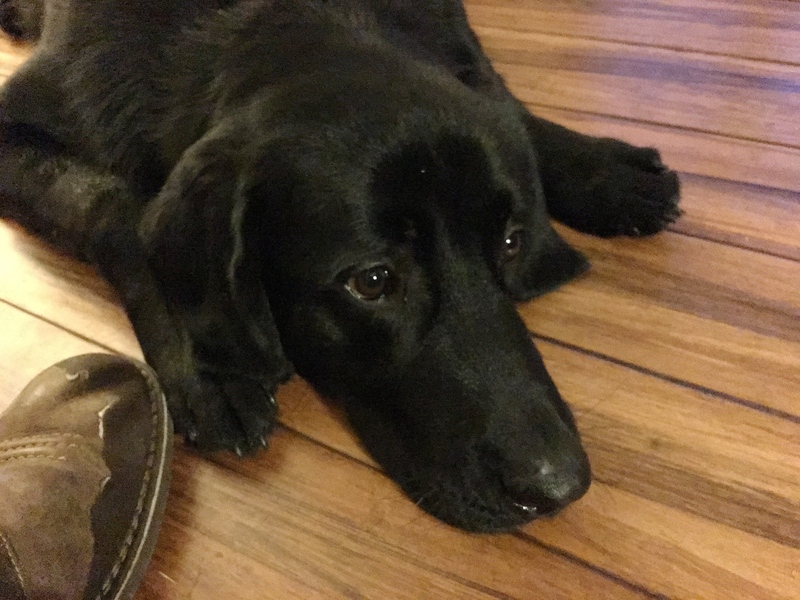 Gunner is an eight-month-old Black Lab / Newfoundland mix who pulls on the leash, runs into and mouthes his guardians and is prone to over excitement. When I arrived for the session, Gunner was pretty calm until I stepped inside. I noticed that as soon as he started to move towards me, his guardian instinctively grabbed him by his collar and started to pull him back. When an excited dog is held back from a stimulus (in this place a new person) who has just arrived and remains in close proximity, the restraint can actually intensify the dog’s reaction to the original stimulus (my arrival). So by physically holding the dog back, his guardian was actually making him more excited. A better way to deal with the situation is to communicate that the dog is to stay away from the door on his own. Otherwise the dog thinks that greeting people at the door is part of his job. I had the families father pretend to be in arriving guest knocking at the door so that I could teach Gunner and his guardians this more structured way of answering the door. By asking the dog to remain behind the human and behind a designated boundary such as the top of the stairs, we make it easy for them to participate from a distance. The distance helps the dog see the arrival with less intensity. We reset the exercise and this time the family’s mother answered the door. It shouldn’t take more than a handful of repetitions at this exercise before Gunner learns that his job is to stay at the top of the stairs and allow his guardians to answer the door on their own. Because he’s probably going to double in size, keeping him out of the narrow entryway will pay big dividends down the road. Speaking of size, the family has two preteen daughters that weigh less than the dog, I wanted to show them how they can pet the dog in a way that makes him respect them as authority figures. Over time, this simple positive reinforcement ritual will help Gunner develop a deep respect for all of the members of the family. Of course positive reinforcement isn’t going to always work. In fact it was the guardian’s immediate petting that had conditioned the dog to invade the human’s personal space in the first place. While this is not as big of a factor for the family’s father, it had resulted in the daughters and wife occasionally being bumped or run over by the dog. I suggested that the guardians start to practice a set of escalating consequences whenever the dog invades their personal space without invitation. I have been recommending the use of these escalating consequences to my clients for years because they work so well. A big part of its effectiveness is because they allow the guardians to speak to the dog in a language that they are most familiar with, body language. To help the family practice delivering these escalating consequences I showed them a leadership exercise I developed a few years ago. As you can see in the video, the father moved a little bit too quickly the first time he ran through the exercise. It is important that you pause at each step and read the dog, only moving forward if it remains in place. The father repeated the exercise a couple more times until the dog was laying down almost instantly. One by one I walked the members of the family through the leadership exercise until we got to the precocious six-year-old daughter. It was great to see how quickly Gunner was adapting to the new techniques and exercises. A great example of stopping unwanted behaviors when a dog is a pup rather than letting it get progressively worse. This session would’ve been much more difficult were it scheduled six months or year from now. By the end of the session, Gunner was already showing significant improvements. He wasn’t running into people, was keeping himself calm and obeying the first time he was given a command. Now that the family knows how to communicate with the dog in a way that he understands and respects, it should be a snap to put an end to the rest of Gunner’s unwanted behaviors.